One of the most obvious signs of a beginner paddler is “paddle-hugging.” It’s okay, we won’t judge you for it, but please note that it’s not an efficient way to paddle. Paddle huggers tend to keep the paddle as close to their body as possible, with their elbows bent. This is going to leave you sore and stiff sooner rather than later. 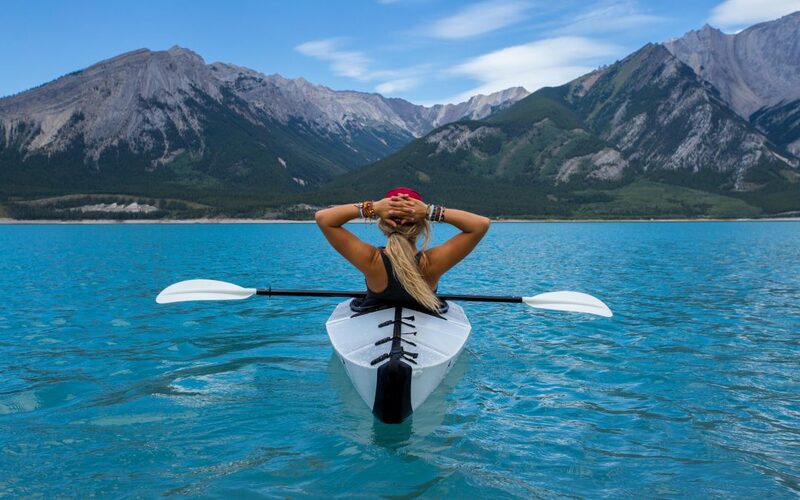 Instead, work on your paddler’s box by sitting up straight, and reaching your paddle farther out in front of you, as far away from your chest as possible. Once you master this, it’ll be a lot easier to paddle for a longer amount of time. Side note: It’s a paddle, not an oar. Oars are for canoes. Paddles are for kayaks. Another rookie mistake is bracing your upper body. Beginners do this because it feels more stable, and you think you have more control. What you’re actually doing by locking up your torso is shortening your paddle stroke. Your core is effectively the strongest part of your body, and if you’re not using it to power through your stroke, you won’t get very far, and you’ll be very sore at the end of the day. Keep your torso relaxed, and imagine your stroke is coming from your core, rather than just your arms, and you should start to feel some more power. It’s a natural human reaction to lean away from something that seems dangerous, or that’s going to hit you. The issue here is that leaning away from a tree branch or any other object in the river is likely to flip your kayak. Essentially, your body will act as a counterweight when you run into the object, causing water to flow over, and then tip your kayak. So even if it seems really difficult, try to remain balanced, or lean towards the object, using your hands against the object to keep yourself from flipping. Another counterintuitive issue, many beginners make the mistake of leaning upstream when they feel they’re in danger, or even just when they’re going through a little bit of whitewater. The problem here is that when you lean upstream, you’re leaning into the current, which will flow right over you and flip your kayak. It’s important to stay balanced in the water, and maintain an aggressive forward lean when going through any whitewater. The absolute worst thing you can do in any water sport is panic. We get it, kayaking, especially in whitewater, can be a fast-paced adrenaline rush that you’re not always prepared for. No matter what happens, remain calm. The more panicked you get, the harder it is for you to swim, or disentangle yourself if your kayak flips. If you get thrown out of your kayak, grab hold of it, get your head above water, and take a deep breath. In a lot of rivers, you’ll be able to just stand right up and recover. Either way, whether you’re in the kayak, or you’ve flipped out, make sure to relax. The calmer you are, the better you’ll be able to handle adverse situations, and the easier it will be for your guide to provide you with assistance. Just keep paddling, and you’ll be fine. If you’ve caught the kayak bug, Earth’s Edge has everything you need to get properly geared up for your next paddle trip! Check out our paddles, kayaks, PFDs, helmets, and other kayaking gear at our brand new website! Whether you’re going down Class IVs, or you’re cruising around the lake, we have what you need.